Expression transformation is used to calculate values in a single row before you write to the target. For example, you might need to adjust employee salaries, concatenate first and last names, or convert strings to numbers. 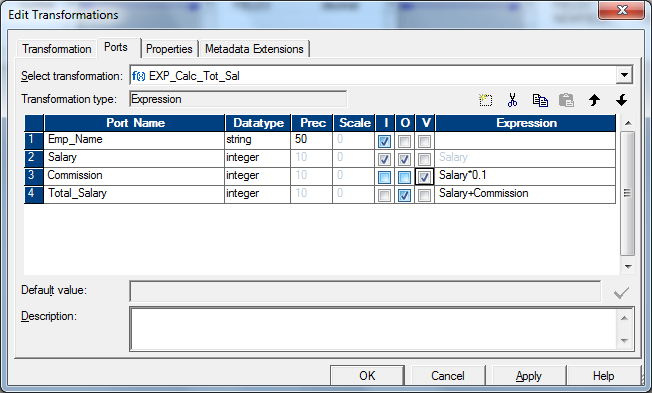 You can use the Expression transformation to perform any non-aggregate calculations. Calculation of Values:We must include the following ports to calculate values for a single row in Expression transformation. - Input or input/output ports for each value used in the calculation. - Output port for the expression. You enter the expression as a configuration option for the output port. The return value for the output port needs to match the return value of the expression. You can enter multiple expressions in a single Expression transformation. You can create any number of output ports in the transformation, as long as you enter only one expression for each output port. In this way, you can use one Expression transformation rather than creating separate transformations for each calculation that requires the same set of data. Note: To perform calculations involving multiple rows, such as sums or averages, use the Aggregator transformation. Unlike the Expression transformation, the Aggregator allows you to group and sort data. For details, see “Aggregator Transformation”. Also, note that “Aggregator Transformation” is a Active transformation. 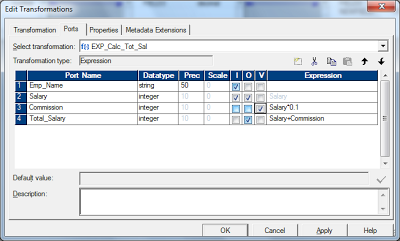 The following example shows how a Expression transformation can be used to Calulate Total_Salary fro each employee.